Would you like your employees to take more ownership in your organization? Most business owners would. How can you empower them to take on this sense of ownership, a buy-in so immersive they offer to help fellow employees when they are overwhelmed or need help meeting a deadline? When your team shares feelings of harmony, work together under difficult conditions or mixed communication styles, productivity and results improve. When your team has Stake in the Outcome (the name of Jack Stack’s second book on Great Game of Business) performance levels and most importantly profit rise. One of my customers recently shared his experience with Great Game of Business implementation with a customer who is looking to implement some type of profit sharing in his company. Ultimately this customer would like to possibly do an ESOP as he approaches retirement. Creating a profit-sharing incentive feels like the right first step. My customer who implemented Great Game of Business in his business when I coached him offered some revealing insights. When they started GGOB they had 9 employees. 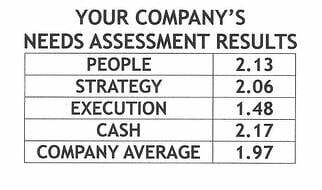 The program is designed to reward employees when the company exceeds the year’s profitability target. How much is determined by the owner or Board of Directors. Each quarter when profitability is achieved each employee is awarded a bonus based on their compensation. The quarterly incentive is established to increase as the year proceeds so that the largest bonus is awarded in the fourth quarter to prevent the company from paying for results that aren’t ultimately achieved by year end. At the same time, a missed quarter profit doesn’t necessarily disqualify the staff from that quarter’s bonus. If the profit criterion for the year or quarter is achieved in a subsequent quarter or by year end the full incentive is still awarded. This keeps the team focused on the long term result, and there’s no penalty for incurring one or several bad quarters if the ultimate objective is reached. My customer noted his team made decisions on current personnel and adding new employees based on what they felt the people and positions contributed. In doing so when people left, either by design or by choice, the staff made the decision not to replace them. As a result 9 employees became 6 and the company continued to be profitable and reach its objectives leading to greater incentives for those 6 who remained. Scott and I started working in early 2012. Reducing staff by 1/3 yet continuing to grow at over 15% a year is impressive. This year his staff finally agreed that they need to add a staff member. They invested time considering this decision. While it would reduce their possible share of incentive they agreed that the long term outcome of adding this position would greatly enhance profitability for the future. The team felt sacrificing short term gain for the long term worth it. This revelation convinced my customer investigating GGOB that it is worth pursuing. He plans to implement the Great Game of Business program as soon as he and I can attend both the Get in the Game Workshop and The SRC Experience. Great Game of Business is a process. The evolution of it for my customer began by implementing the Rockefeller Habits. We developed annual and quarterly plans. Each team member created a dashboard to track their metrics toward their personal and company’s priorities. The business Topgraded each position, built a Job Summary Scorecard to identify accountabilities and key competencies for each position. These measures brought a level of accountability and appreciation for what the business needed to achieve. At the same time they discovered their Core Purpose and Core Values. These assured current team members and any new staff would be in harmony with their culture. My customer who plans to implement the GGOB in his business has all the Rockefeller Habits elements firmly established. This next step should be an easy transition and growth for his team of 75% A players. This afternoon one of my customers introduces their 3rd Trimester Theme “Fix What Bugs You.” It’s based on 2 Second Lean. Fixing What Bugs You is important to Quarterly and Annual planning. It is an important effort to determine your Priority. Another critical element, once you’ve determined your One Thing for the quarter r, can make or break your ability to achieve it. We'll explore what that is and how to make sure you get it right next blog’s topic.